The adult bed bug is a flat, oval insect 5mm long by about 3mm broad. It is reddish brown in colour, and quite common throughout the UK. BPC Pest Control in Hornchurch, Essex guarantees you low cost and effective treatment for this problem along with mice and rats, fleas and cockroaches amongst others. We are happy to work with both domestic and commercial clients and have regular contracts with several letting agents, estate agents and private landlords. Contact us to discuss our services, which are available throughout the South East including central London. Bed bugs do not fly so they must crawl or be transported on clothing, luggage, books or furniture, in fact anything that provides them with harbourage. 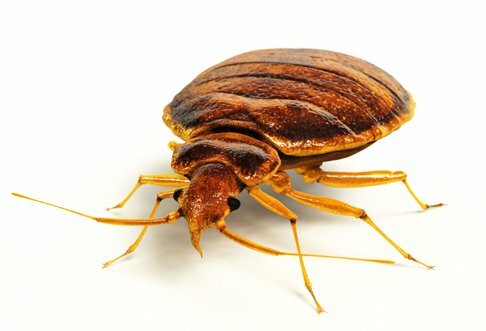 Bed bugs feed on blood and they can survive for long periods of time without feeding. Bed bugs are usually associated with poor, overcrowded and unhygienic conditions but can be transported to any premises. In domestic premises most infestations are found in the bedroom. Their hiding places will be close to where their host sleeps – in the bed frame, mattress, bedside furniture, skirting boards or wallpaper, in fact anywhere that affords a dark hiding place during the daylight hours for these nocturnal creatures. Increased use of central heating and the resultant warm conditions which stimulate continuous activity and feeding over the winter months. The movement of second-hand furniture which may transfer bed bugs from one property to another. Bed-bugs’ blood feeding can cause severe irritation in some people. They are not however, known to carry disease, unless that is if you regard insomnia as such! The female bed bug lays pearly white eggs approximately 1mm long, which are ‘glued’ into cracks and crevices in bed frames, furniture and wallpaper, in fact anywhere that provides dark harbourage during daylight hours. They will lay about 150 eggs which will hatch in 10 to 20 days and will reach adulthood in approximately 9 weeks under reasonable conditions, but will be considerably longer if the temperature is low. The adults live for up to 18 months, usually feeding weekly, but can survive for over a year without blood. Bed bug extermination requires the affected rooms to be sprayed with a professional strength insecticide. This will be applied to all beds (including mattresses, bed surrounds and headboards) as well as the edges of the rooms where bed bugs will commonly be attracted. Depending on the level and stage of infestation more than one visit may be required. Unfortunately bedding, curtains and clothes cannot be sprayed and will need to be hot-washed.